It struck me as I watched the teams try to find how their technology would solve real customer problems, is that machine learning is following a similar pattern of previous technical infrastructure innovations. 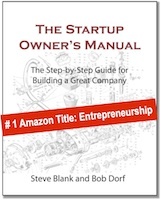 Early entrants get sold to corporate acquirers at inflated prices for their teams, their technology, and their tools. Later entrants who miss that wave have to build real products that people want to buy. I’ve lived through several technology infrastructure waves; the Unix business, the first AI and VR waves in the 1980’s, the workstation wave, multimedia wave, the first internet wave. Each of those had a set of common characteristics that the Gartner Group characterizes as the Hype Cycle . Stage 1: The Technology Trigger: A potential technology breakthrough kicks things off. Early proof-of-concept stories and media interest trigger significant publicity. Often no usable products exist and commercial viability is unproven. Stage 2: Peak of Inflated Expectations: Early publicity produces a number of success stories—often accompanied by scores of failures. Some companies take action; most don’t. 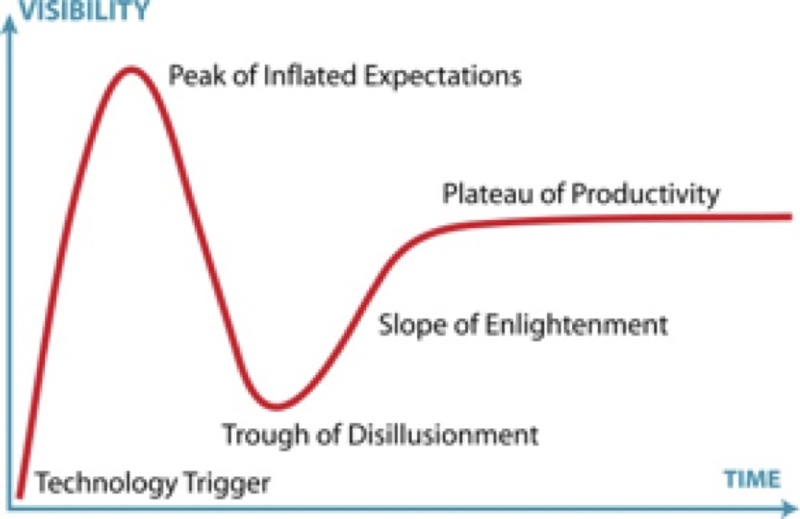 Stage 3: Trough of Disillusionment: Interest wanes as experiments and implementations fail to deliver. Producers of the technology shake out or fail. Investments continue only if the surviving providers improve their products to the satisfaction of early adopters. Stage 4: Slope of Enlightenment: More instances of how the technology can benefit the enterprise start to crystallize and become more widely understood. Second- and third-generation products appear from technology providers. More enterprises fund pilots; conservative companies remain cautious. Stage 5: Plateau of Productivity: Mainstream adoption starts to take off. Criteria for assessing provider viability are more clearly defined. The technology’s broad market applicability and relevance are clearly paying off. What’s become apparent in the last few technology hype cycles is that for startups and their investors there is a short multi-year window of opportunity (at the Peak of Inflated Expectations) to sell a startup at an inflated price. This occurs because large technology companies (Google, Facebook, IBM, Microsoft, Twitter, Apple, Salesforce, Intel, et al,) and increasingly other non-tech firms, are in an arms race to stay relevant. 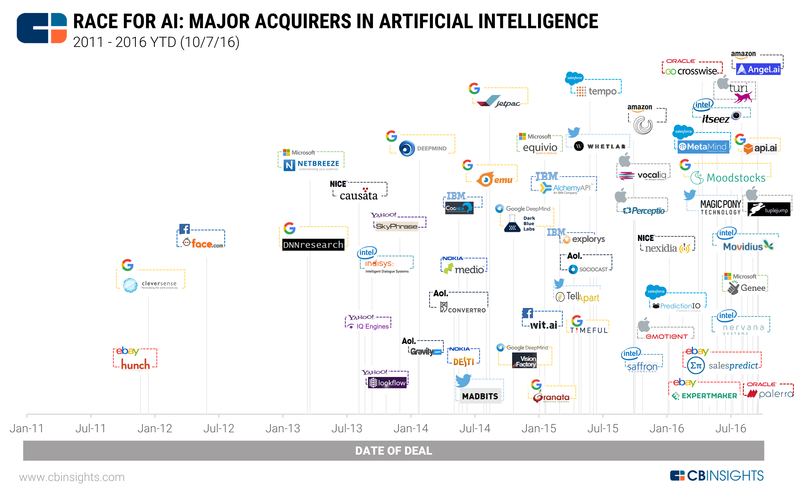 For example, according to CBInsights nearly 140 machine intelligence have been acquired since 2011, with over 40 being bought so far in 2016. Most often the first acquisitions in a hype cycle are for the “shiny objects” – the technology, the team and the tools. The acquired technical teams usually start up or complement the company’s research group in a specific new technology area. If you’re a startup (or their investors) getting acquired at this point in the hype cycle is exactly where you want to be – short time in business, large acquisition price, value based on a frenzy, perceived scarcity of expertise, and fear of a competitor getting the key talent. History shows that the acquirers often overpay buying this expertise early. While these acquisitions have teams of great researchers, they rarely contribute actual revenue generating products (because most never reached that stage when they were acquired.) The irony is that the acquisitions made later in the hype cycle – when companies have built real products that customers want, are the ones that generate revenue and profit for the acquirer. I had all that in mind as we watched our teams present. Each week the teams got out of the classroom and talked to 10-15 customers, testing a new part of the business model canvas. And after week two, they had to build and then update their minimal viable product weekly. And present what they learned each week in an 8-minute presentations. The presentations below are their final Lessons Learned presentations, along with a 2-minute video summary. Three Berkeley PhD computer science students and an MBA working on machine learning. How can you not hit out of the park on day one? Before this class this team had spent three months in an incubator building the product after talking to only one customer. After week two of the class they realized they had wasted three months building something no one actually wanted. What they next learned was pretty amazing. Homeslice had a great journey. They came together over a personal pain – the inability to afford a house in Silicon Valley. Their initial plan was to provide fractional ownership to solve that problem. But they found that first serving an adjacent market – slices of investment properties – could serve as a launchpad for their initial idea of fractional home ownership. Exit Strategy was building the penultimate planning tool. This teams learning that this wasn’t a business was as important as finding one that is. Really impressive process. This class this was a team effort. Professor Kurt Keutzer and Errol Arkilic (former program director for the National Science Foundation Innovation Corps (NSF I-Corps), now founder of M34 Capital) were the lead instructors. Steve Weinstein (CEO of MovieLabs) and I assisted. Thanks to our TA Kathryn Crimmins and all the team mentors: Lev Mass, Kanu Gulati, Ewald Detjens, James Cham, Kanu Gulati, Patrick Chung, Rick Lazansky, Ashmeet Sidhana, Mike Olson, Michael Borrus, Fabrizo De Pasquale, Amit Kumar, Rob Rodick, Mar Hershenson. Starting up in Moore’s late main-street market is the real problem. That actually dictates that you’ve started post-growth. The IPO won’t earn a premium. 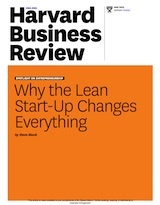 Late is where lean works, but that doesn’t mean late works for anything more than a little cash. The Hypecycle doesn’t apply prior to entry into the IT horizontal. If it is IT and geek, it won’t sell to consumers. Much is confused today. Can you expand a bit for the other readers who aren’t familiar with the concepts. The phases can be seen as a process. Discontinuous innovation must start in the first phase and work through each phase to the last. 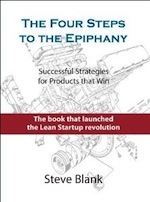 For discontinuous innovation, skipping a phase will stop the process of adoption. Continuous innovations, those built on existing, adopted infrastructural elements, can be brought to market more randomly. Moore’s taxonomy puts the technical enthusiast, B2B early adopter, the chasm, the B2B early adopter’s vertical market, the IT horizontal market, and the Tornado at the front of the IT horizontal market in the early phases of the technology adoption lifecycle. The taxonomy puts the consumer market, device (laggard) market, and cloud/disappearing (phobics) market in the late phases. Moore put all of those phases under a summative normal distribution. The peak of the normal distribution happens at the mean. The early phases, those to the left of the mean, are on the growth side of the normal distribution. The late phases, those on the right of the mean, are on the decline side of the normal distribution. You can think of early as Web 1.0, and late as Web 2.0. Web 1.0 was characterized by discontinuous innovation, selling the actual technology, early VC financing larger deals with long timeframes, VC involvement in the management of the firm, and IPOs that earned a premium, a vast multiplier of the underlying stock price. Web 2.0 was characterized by continuous innovation, selling anything but the actual technology, the using of someone else’s technology, meager VC financing, a dearth of VC involvement in the management of the firm, and IPOs that don’t earn a premium–lower expectations. The technology adoption lifecycle is usually seen as a sequence of market populations over time. But, it also positions management practices. “Design” is pushed as universal, but no, it is fit only in the late phases. MBA, orthodox mgmt practices, are late phase as well. VCs talking about the quality of the team matters in the late phase because the exit, rather than the IPO is how late phase companies put money back in the VC’s pocket. In the early phases, branding is done only for investor marketing. In late, branding reaches the customers. UX similar. The early phases are where we create economic wealth: categories, value chains, and careers. The late phases are where we capture cash in a category that already exists. I don’t see much discontinuous innovation these days. Using existing technology to automate real or fictional domains might be new to that domain, but the technology is the same technology we used to automate other domains. This stuff is the stuff of continuous innovation. I realize that the objective of venture capitalists is to make money, but aren’t you concerned about the obvious ethical compromise of positioning a product to sell just before the “trough of disillusionment” hits in a given market? Clearly you realize that the product ideas are being oversold by a huge margin at this point. In the present case of Machine Learning, I am seeing this happening in droves. ML as AI is being frightfully oversold. As an AI researcher I’ve watched the definition of Artificial Intelligence be steadily dumbed-down to the point where what passes for AI today is little more than truth tables and searchable event histories. Product developers, who really know nothing of true AI, jump on the hype bandwagons of so-called ML platforms in the hopes that they can just plug-in someone’s unproven IP and avoid actually understanding AI at all. Any statistician will tell you that forcing data into an asymptotic system at the height of the first peak is essentially a self-fulfilling prophecy. It’s no use pretending the Hype cycle is an impartial observation of natural economic processes. It’s nothing more than market manipulation at the expense of true productivity. It would get better named the Greed cycle.